Is it just us or does it seem like the moment we start a diet, our cravings go into overdrive? Dishes we barely ever gave a second thought are suddenly at the forefront of our minds, enticing us with their deeply caloric flavors and utter decadence. Surely there is solid medical reasoning behind this, but that’s neither here nor there. Eating healthy or abiding by the strict guidelines set by a diet shouldn’t have to feel like a chore or an unfair compromise. Instead of having to give up the foods you love, make a handful of health-conscious swaps that will satisfy said cravings and remain compliant with whichever fad diet is your current flavor of the month. Read on for the healthy alternatives to the dishes you’re probably (definitely) craving right now. Donna Hay’s cauliflower crust pizza is a refreshing take on the classic if we’ve ever seen one. Topped with garlic, lemon zest, and crispy kale, it’s the guilt-free bite of pizza your life was missing. Nothing beats an indulgent bowl of saucy potato dumplings, but this healthy take comes pretty close. Delish’s version of the Trader Joe’s classic is drenched in marinara and a touch of cheese. Consider this a deconstructed rendition of the Taco Tuesday staple. With the bounty of greens serving as the base, you can freely indulge in the chipotle-seasoned taco meat and crushed tortilla chip and cheddar garnish. It’s safe to say that cauliflower has secured itself as the go-to alternative to most complex carbs. Primavera Kitchen’s vegan-friendly skillet recipe features a cauliflower rice base paired with sauteed garlic-mushrooms. Your go-to sub becomes exponentially healthier when lettuce is swapped in place of the bread. Feel free to stick with your fillings of choice or take note from Lexi’s Clean Kitchen and get creative with BLTs, tuna melts, and more. It’s hard to believe that a dish as mouthwatering as this could boast any sort of healthy qualities, but Lindsay of Pinch of Yum managed to make it happen. 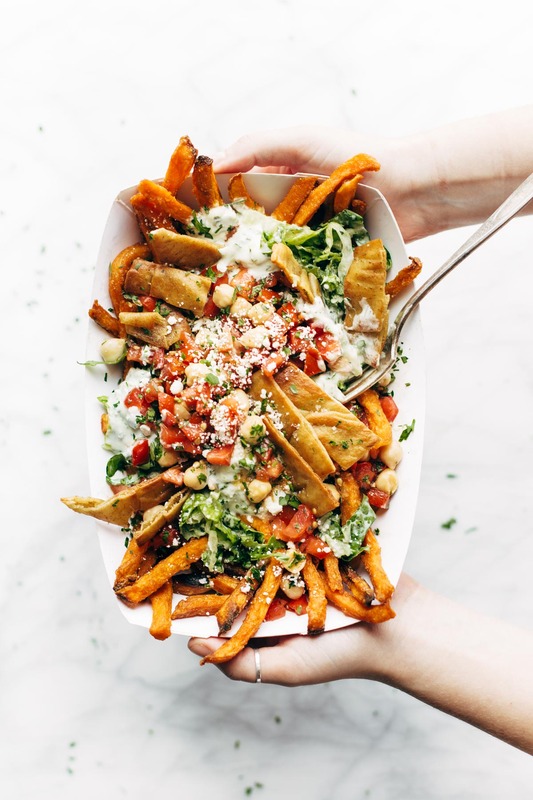 Set on a bed of sweet potato fries, this loaded combo comes with tzatziki, marinated tomatoes and chickpeas, and feta cheese. This 15-minute, one-pan garlic-butter chicken recipe from Eat Well 101 skips out on the carb-heavy rice and will satisfy just about every craving you’ll come to have. Cauliflower rice not your thing? Spaghetti squash makes for another great alternative to pasta or similar carbs. Half Baked Harvest’s Crockpot lasagna bolognese is actually what dreams are made of. Sure, this may be a bit of a stretch from spicy, buffalo sauce–drenched wings, but indulging in the dish in the form of pizza more or less evens things out—even if it does happen to be a vegetarian-friendly one. If you’re going to have to have fries, at least make them a touch healthier than its deep-fried counterpart. This garlic Parmesan– loaded version warrants little convincing.